Jazeman Jaafar drove the MERCEDES AMG PETRONAS Formula One demo car, the MGP WO2, on the Silverstone National circuit yesterday for a PETRONAS filming day, his first experience of driving an F1 car on a race track. 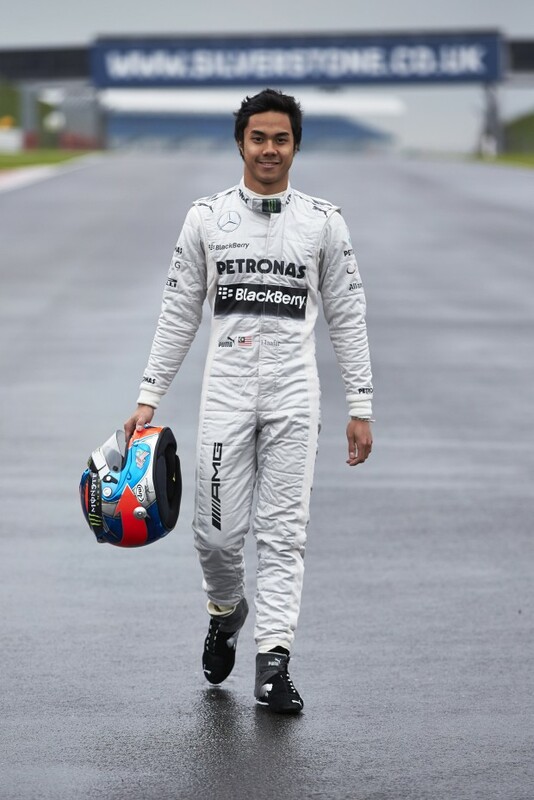 Jaafar’s first run in the car came in March, when he was behind the wheel for a PETRONAS demonstration run event around the streets of downtown Kuala Lumpur ahead of the 2013 FORMULA 1™ PETRONAS MALAYSIA GRAND PRIX. He returned to the cockpit of the MERCEDES AMG PETRONAS demo car yesterday morning for the 100 kilometres session and after a productive day of running was thrilled with the experience. The 20-year-old Malaysian said of the experience, “One word sums up my day – amazing! I loved every minute of it. In the morning the track was pretty wet so we just did an installation lap and then waited until the weather was a bit better. I then had another run in the morning and even though the track was still damp I was really impressed with the amount of downforce and the brakes and was able to start building up a bit more speed. In the afternoon the track dried out so I had another run on slicks. The car was awesome and I thoroughly enjoyed the opportunity I was given.